On-line combustion analysis is carried out by mobile time-of-flight mass spectrometers (TOFMS), equipped with an Nd:YAG laser for photoionisation. The entire setup is built in a rack on wheels and only requires external power supply, so the instruments can be deployed in field studies. Nd:YAG lasers emit fundamental radiation of 1,064 nm, which is shortened to wavelengths in the UV and VUV-range by non-linear optics, thus providing sufficient energy for the ionisation of the vast majority of organic, but also for few inorganic compounds in combustion processes. Resonance-enhanced multi-photon ionisation (REMPI) at 266 nm refers to a selective ionisation technique for aromatic and polyaromatic substances, including the substance class of polycyclic aromatic hydrocarbons (PAH), which is known to be carcinogenic. Those aromatic compounds absorb 266 nm photons and get in an electronically excited state. If that intermediate state covers a sufficient lifetime, a second 266 nm photon can exceed the energy barrier to the ionisation continuum. In contrast to REMPI, single photon ionisation (SPI) at 118 nm is regarded as a more universal ionisation technique which is capable to ionise any compound with an ionisation energy below the photon energy. 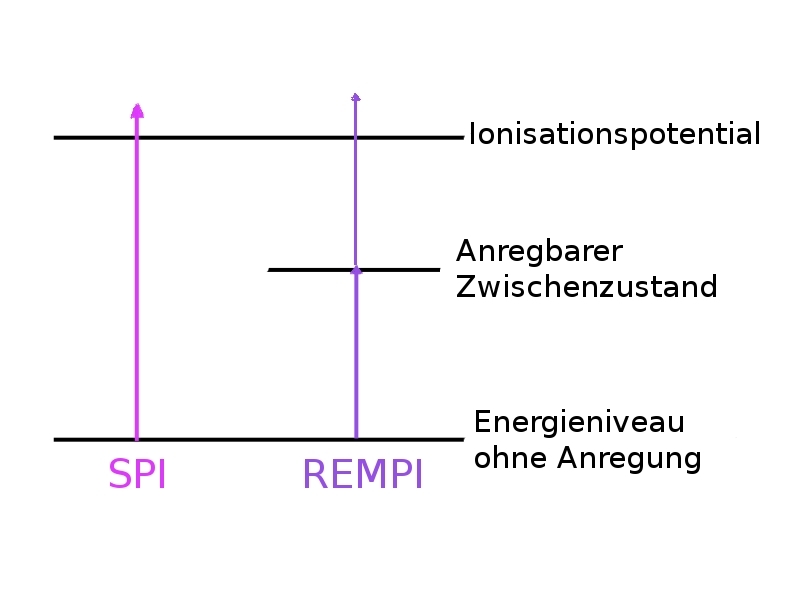 Both SPI and REMPI transfer only marginal excess energy on the analyte molecule. On that account, predominantly molecular ions are generated, which simplifies the interpretation of mass spectra of complex mixtures. The research focus is on the investigation of volatile emissions from wood stoves and diesel engines, which both gained more and more attention during the last decade. In Germany, firewood became an essential part of renewable energy sources in the course of “Energiewende”, but also denotes a globally important constituent for energy production. Moreover, emissions from diesel engines, not only of on-road vehicles, but in particular of ships, are examined at the chair of analytical chemistry in cooperation with the chair of piston machines and internal combustion engines (LKV) at the University of Rostock. It is tried to find relations between emissions and fuel switching from heavy fuel oil to diesel or liquefied gas or variations in engine conditions, such as engine load, charge pressure or crank angle. The high time resolution of the SPI/REMPI-TOFMS of 1 s (up to 50 ms maximum) allows the investigation of dynamic real-world combustion scenarios and the detection of single species in real-time. For example, high temporarily dynamic emissions occur during load change or batchwise combustion of log woods. In this way, temporal emission maxima and shifts in the emission profile can be identified from which measures for emission reduction can be derived and adopted to further suppress the secondary particle formation from volatile compounds by atmospheric oxidation. Finally, the chemical composition is correlated with results from biological experiments to assess the efficiency of emission regulation for the improvement of air quality.